The turntable set looks much the same from any angle: gutted concrete tenements and perilous alleys, instantly recognizable as a scene of urban guerrilla mayhem. People lived here once. They still do, actually, hidden in the rubble, caring for the wounded, raising children, scavenging food. Indeed, during the overture one of the inhabitants drops from the city wall to raid the camp of the besieging army for bread, and is nearly shot while he’s about it. That may sound like a modern directorial whimsy, but it was called for at the premiere in Naples in 1836 as well as at the current production at Glimmerglass. The uniforms and weapons are a bit different, though. Donizetti’s The Siege of Calais (Glimmerglass, giving its American premiere, doesn’t bother with the Italian title, which is L’Assedio di Calais, though the work is sung in that language) was awkwardly designed for presentation in Naples but in hopes of a Parisian transfer—a city with very different tastes in operatic spectacle. This conflict of method and means may explain why it did not linger on the stage and received no second production for a century and a half. That was most unusual for Donizetti, then at the height of his fame. Just now, Siege is having a burst of popularity (England’s Opera North last year, Boston’s Odyssey Opera this fall) due, not least I suspect, to its relevance to current events and the nature of the characters, who are ordinary folks rather than the high and mighty. There is no star-crossed love story in this opera (the leads are already married, with children) and royals are not central to the story, only to the denouement. The opera tells the once famous story (nowadays recalled by Rodin’s sculptural group) of the beginning of the Hundred Years’ War, when Edward III, needing a port on the French side of the Channel, offered to let the long-besieged townspeople of Calais surrender and survive if six prominent citizens would submit to whatever fate he decreed. Assuming he would kill them, six burghers volunteered, whereupon, supposedly at his queen’s behest, he let them go free as well—as he does in the opera. The townsfolk sing of remaining French, come what may—Donizetti guessed this would go down well in Paris. At Glimmerglass, the chorus is small but hearty, and the subtitles omit any reference to nationality (while singing “Siamo sempre francese!”) in order to put the universality of the message across. The singers are also mixed racially (Porgy and Bess is another item on the summer agenda), and this renders the stage pictures more generally relevant, no doubt the intention of director Francesca Zambello and set designer James Noone. We might be in Syria, Iraq, Liberia, Libya or Chechnya. Ruined concrete towers all look alike. The score, though it contains several jewels, is, perhaps, insufficiently rich to hold the stage on its own merits and needs a hook to current events to make itself matter. The family we meet amid the battle are very human: Eustachio, the Mayor, his wall-jumping son Aurelio, and Aurelio’s wife, Eleonora, who also has their young son to worry about. The forms their confrontations take are traditional, the melodies pure Donizetti, but the singers bring urgency and terror into the song. This is a modern update that earns every nervous tear of attention. The big role is Eustace de St-Pierre, Eustachio. He is a noble baritone in the tradition of Il Furioso, Belisario and Torquato Tasso. The bel canto revival of modern times was, at first, largely driven by prima donnas, but Donizetti wrote vehicles for brilliant tenors and baritones as well. Eustachio’s heart bleeds for his people (especially his adventurous son), but he is canny in negotiating with unruly citizens and English generals. 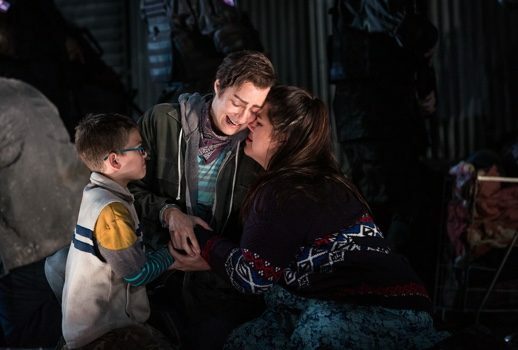 At Glimmerglass the part is taken by Adrian Timpau, a young singer whose rumbly, reassuringly paternal sound fills the theater and touches hearts with its worried reflections. Leah Crocetto, the Eleonora, has sung Liu, Tosca, Aida and Elisabetta di Valois in places like San Francisco and the Met. She produces the warm, generous, well-rounded notes called for by such roles, but what is she doing singing Donizetti in a tiny house with a tiny orchestra? Those great big notes are fun, but this opera does not require them. What might be useful is a bel canto line that runs seamlessly up to such a top, but Crocetto did not demonstrate it here. When she kills the English spy at the end of Act I, it was not clear whether it was the brick in her hand or the note in her throat, solid as a cinderblock, that felled him. It’s a wonderful voice and there are twenty roles I’d love to hear her sing (Aida, Tosca, Elisabetta …), but this one seems out of her fach. Naples didn’t have a star tenor in the fall of 1836, so Donizetti gave his leading man, Aurelio, to a “musico,” a trouser mezzo. Musicos were already out of fashion (he never used one for a lead again; the next generation never used mezzo heroes at all), and he professed himself happy to transpose or replace the music when seeking a tenor to sing the part in Paris. But that version never came to pass so we’re stuck with it. Glimmerglass presented Aleks Romano, a slim, boyish and ardent actor of this daredevil role. The upper range of her soprano is delectable, abloom with little turns and runs, but the lowest notes were a scrape, way out of her comfort zone. Donizetti has given Aurelio and Eleonora one of his irresistible soprano-mezzo duets-with-cabaletta, similar to the one in Maria Padilla, and the ladies’ voices with their very different colors blend lusciously. In an older, truer day the number would have been encored at least once. Michael Hewitt, from the Glimmerglass Young Artists Program, replaced an indisposed bass as King Edward. He doesn’t show up till Act III (to say, “I want them dead!” and then “I’ve changed my mind”), but Hewitt sang his double aria with a fine command of line and breath control. Chaz’men Williams-Ali sang a sturdy burgher with enthusiasm and Zachary Owen was riveting as the Agent Provocateur who attempts to turn the city against Mayor Eustachio, only to be trounced by the crowd. A great moment, this, the finale to Act I, and Donizetti and the Glimmerglass singers knew exactly how to play it. Less effective were the prayer-like choruses of ladies of Calais (in church) and depressed citizens in the streets. Donizetti’s plaintive, pretty melodies did not capture the emotional depth of the situation; too, we all remember occasions (Macbeth, for example, or the opening scene of Nabucco) when a slightly later composer, Verdi, created the proper tragic melody to fit this sort of mood.